PLEASANTON, Calif. - Jan. 17, 2019 - PRLog -- TagRail, pioneers of the seamless customer purchase journey from living room to showroom announced today the general availability of WE3 Digital Retailing Platform at NADA. This new version of the platform builds on top of the existing functionalities that has gained wide acceptance at many of the progressive dealer groups across North America and provides the next generation digital retailing experience for the dealers and customers. · A website plugin that can be added to the existing dealer websites and enable a living room to showroom buying experience. · An in-store application that will integrate with existing dealership systems to make a seamless transition from online to offline. A customer can restart the journey at the dealership under the guidance of a sales consultant. · A rich analytics dashboard that is integrated with google analytics and lets the marketing department adjust the consumer journey based on real-time statistics. 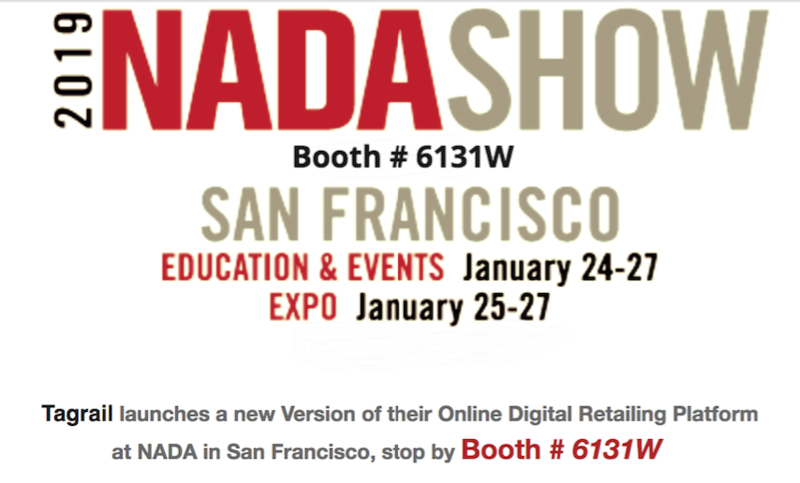 "We are really happy to be showcasing the new capabilities of the platform at NADA. Since digital retailing is becoming more of a commodity, every vendor need to bring in adequate differentiation to gain acceptance from dealerships," says TagRail CEO Kiran Karunakaran. "We believe our differentiation would be our adaptability to existing dealer processes and the ability to customize according to the dealer/OEM website requirements. The WE3 platform is designed with the 3 key pillars in mind - Customers, Dealership and Us and it works seamlessly across 3 different form factors – mobile, tablets, desktop." Sales: Present and track a consolidated view of store inventory through a tablet for v convenience and flexibility. Prompts consultants to ask the right questions to help customers choose the right vehicle. Sets up consultants for success by helping them be more professional and knowledgeable to guide the buyer's decision process. Showroom: Helps create memorable showroom experiences that create lifetime retention. Desking: With complete transparency, pencil a deal with the customer's shoulder to shoulder, adjust terms, rates or price and instantly compare changes, finance and lease options, and when ready, complete the deal and submit to lenders. F&I: Present a complete and compliant F&I menu or ala carte options, select the right options for the make and model and get rates quickly through integration with lender provider systems.